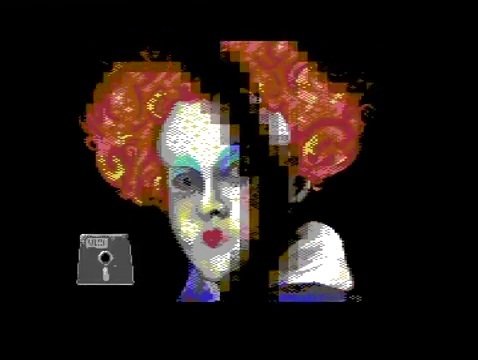 How this commodore 64 demo was made, who did what and other need to knows. 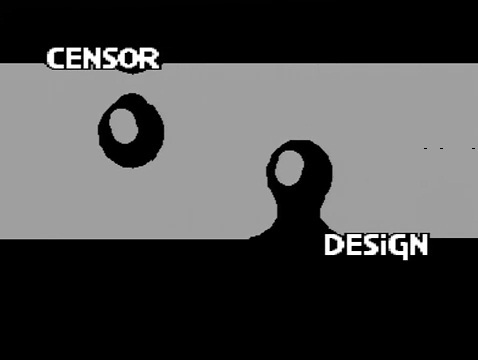 Featuring Bob and Magnar of Censor Design. can! He has many nice effects and always tend to use the borders too. Which is freaking awesome. He got a great way of macro code foe stable raster with cia times. A very special way of doing it. So the cat part is like impossible. All borders. Blinking bitmap. Moving plasma in bitmap text. Circle color scrolling in all borders etc... playing music. It is impossible. But he did it! The morph text which has 2000 moving plots. .. never done before." who is a child hood friend with Lavazza ;) Let's move on to disk 2. 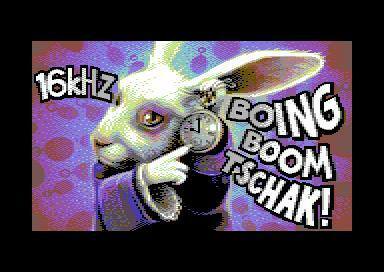 The Sideborder very big Zoom Scroller was coded by CRT, Font by Yazoo. Eyeballs code by moi Bob and additional gfx by Mirage. The screaming girl coded by moi Bob and graphics by Creeper (4 pics) The metaballs code by Axis and graphics by Yazoo. Donkey kong with a twisting scroller code by moi Bob, graphics by Mirage. Intro idea by Magnar. Fractal/chaos Zoomer code by Axis graphics by Yazoo. Flip flopp diskchange part all code and graphics by Mirage. Finally there is disk 3. Sample / the end part code by Swallow. Picture by Mirage and Font by Yazoo. All Sid music in Wonderland XII done by Magnar. All sample music done by Swallow and all linking done by CRT. 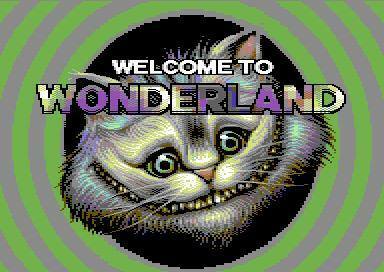 It took us 6 months to develop Wonderland XII in between we also made smaller demos like Sidelined and Daah those Acid pills, all demos won 1st price in respective compos ;) Quite a hectic period I might add." a lot of glitches and errors in them so they had to be patched up with sprites... and this is the tough part where there is no more memory left... also when mooving the raytracer you need to use the whole area of picture... there is normally a hidden space that is not visible... but with the movements that space where used... especially if I had sprites and different background colors. They would be visible, and thus needed to be treated as ordinary picture gfx... I really had no space for the sprites... So inside the picture area I started to use up sprite memory." Then Bob tells Hugi about another impossible impossibility. Bob tells us: "And then the eye balls. They uses all sort of tech. Fld, vsp, agsp and fading. Four animations carefully made to fit the tiles. And all extras around it.. It gave memory problems here as well... but if you are using the black color you can hide some stuff in it." And now it's about time to switch over to Magnar again. What can Magnar tell us more about Wonderland VII to give us some look behind the curtains. Magnar: "Axis made that tornado clock part one week before the Baroque Floppy People Party.. Sometimes a part goes quickly to create. Next to the cat part and flip disk part 2 Mirage also improved the metaballs part by Axis and additionaly made loads of graphics. 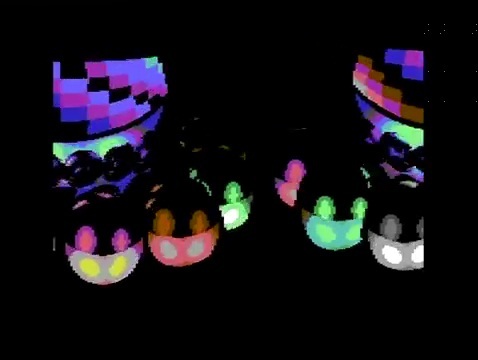 Bob coded the first big balls on chain effect and the big koala screaming girl part and the twisting scroller. 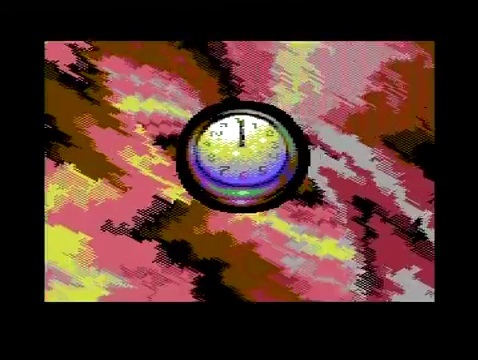 Axis and Mirage added effects on top of color cycling by CRT and Bob. Which together made it all very well in variations and effect types. CRT did lots of transitions. Linking and the zoom scroller too. And not forget Swallow for the full credits. Read the end scroller at Swallow page 3. But it is true that bob and CRT wouldn't have been able to create this demo without code also from Axis, Swallow and Mirage. But all together it became a very powerful demo." inspiration and thought I would never get the music ready in time. As part of a solution, I started doing random sequences of music just to have material to later build from. I made many songs into one song, so I could easily shift and remix. Then when the script of demo parts became more subtle, I could rearrange and put together the different parts I had made for the different effects in mind, and the rest of the work would mainly lay on fix transitions in the gaps between." But then Magnar started to face some challenges. "Unfortunately, a lot of the effects was submitted in a very late state of the demo. The tornado with the clock part was checked in the very last week, and also the whole Donkey Kong theme was a very late invention. All these script changes needed also to be reflected song-wise during the last two weeks; and then I ran out of memory! The song limits was $1000-1fff, and each demo-side song was gaining bytes above that. I started to optimize and remove effects and lead solo structures and such, but that just felt terrible. So, I talked with Bob and CRT about it, and we agreed that chopping the two songs per disk side into four songs instead would be the only way forward. After that decision, I only had to redo the song structures, glue it together and make myself ready to travel to BFP. Last song check-ins was done at the party, where I did minor corrections to filter settings on all songs to better fit the suggested Big Floppy People compo commodore 64 machine (which was later changed during the compo due to errors in the VIC chip). 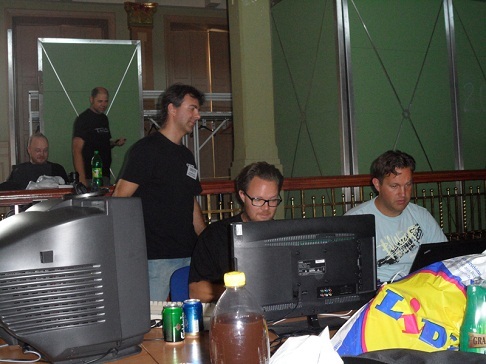 After my finalizing of the songs, CRT created the final link build", Magnar explains and concludes: "And than all Censor members onsite at Baroque Floppy People spilled open Yazoo’s large Donkey Kong beer cans and got ourselves proper seated to enjoy the big screen demo-compo show!"